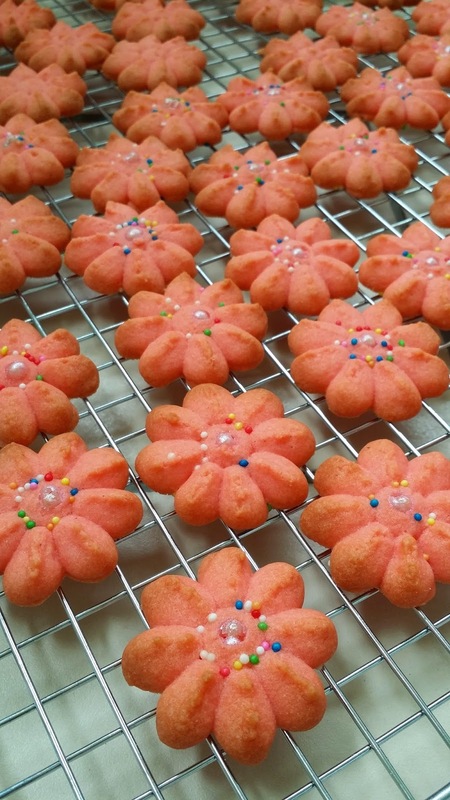 I wanted to make some CNY cookies for my girl's teachers but I guess it would be more meaningful if she helped out too, so I chose this simple recipe. This recipe is perfect for amatuers or children as they can easily help weight, mix, even pipe out the cookies and decorate! Such a simple recipe but so delicious! The cookies have a lovely sweet and buttery vanilla flavor with a texture that is crisp, fragile, somewhat dry, and buttery. "Spritz" is German for "spritzen" meaning "to squirt", which is exactly what is done with this cookie dough. So it's perfect to test drive my new toy, the cookie press gun! Yeah! The original recipe is from here and I followed it quite closely, except for the change in colour! Add the egg yolks and vanilla extract and beat until incorporated. Scrape down the sides of the bowl as needed. Add food colouring until desired shade is achieved. Add the flour and salt and beat until you have a well mixed dough. Bake cookies for about 11 - 14 minutes or just until the edges of the cookies are barely tinged with brown. Remove from oven and gently transfer the cookies to a wire rack to cool completely. In a covered container, these cookies will keep at room temperature for about 10 days or they can be frozen for several months.